For the most part, our small greenhouse has done a great job of keeping bugs off the veges (at least, the flying ones). Of all the plants you’d think bugs wouldn’t eat, chili peppers must be top of the list. 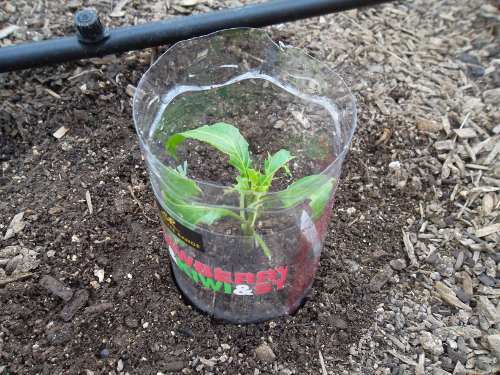 Given we’ve just planted some Bhut Jolokia chili peppers, otherwise known as Ghost Chilis (the world’s hottest), we thought they would be pretty safe from predation. The woodlice (or slaters as we call them in NZ) living in the greenhouse had other ideas. They had nibbled the leaves of the seedlings on the first night after we planted them. Organic growing is often just as easy as conventional with planning and time to prepare for setbacks, but in this case we didn’t have much time before the chili seedlings would be too far gone to save. To the internet for inspiration! You can physically stop the woodlice getting to your plants by using almost anything as a collar around them. A few plastic bottles and jars cut up worked nicely. 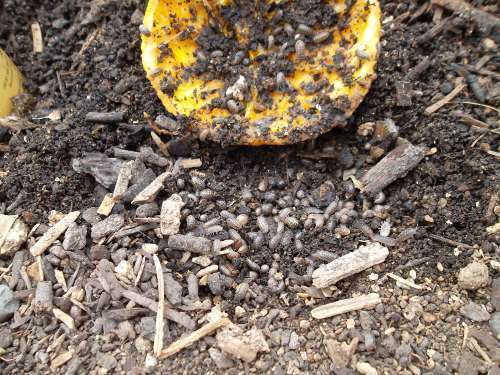 I removed the top layer of mulch and compost from around the plants first to remove most or all of the woodlice first (no point in trapping them in there with their dinner). The most effective of the traps we tried was the half-citrus trap. 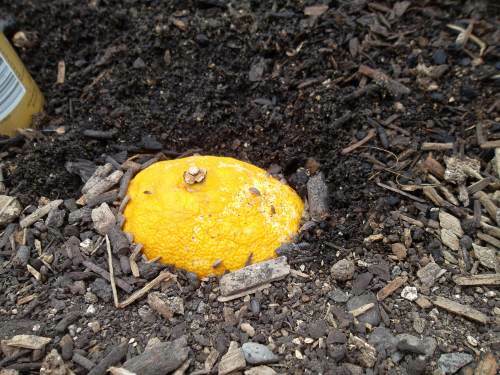 It’s really simple, just put a half orange (or grapefruit in this case) face down on the soil. You can juice it first if you don’t want to waste it. The next day, turn it over and scoop up all the little buggers. I call the chickens over (yes they know to come for food) and throw the handful of woodlice on the ground for them. I’d been getting a couple of hundred woodlice a day from two citrus traps this week, but the numbers are starting to drop off now – a good sign. 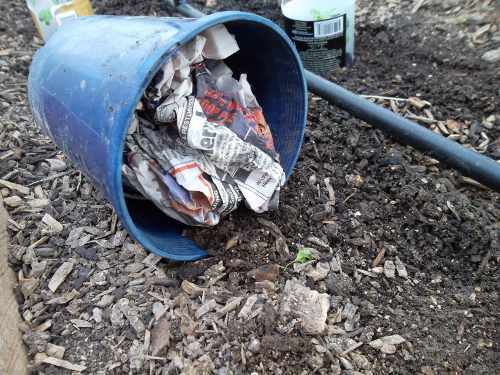 The other trap we tried was a plant pot filled with damp newspaper. The woodlice will nest in it overnight, but this didn’t work quite as well as the citrus trap, possibly because the grapefruit skin was too hard to resist. If you’re squeamish about touching the woodlice, this trap is good as you can just take out the paper in the morning and throw it away. Diatomaceous earth consists of fossilized remains of diatoms, a type of hard-shelled algae. Diatomite is used as an insecticide, due to its physico-sorptive properties. The fine powder absorbs lipids from the waxy outer layer of insects’ exoskeletons, causing them to dehydrate. Arthropods die as a result of the water pressure deficiency, based on Fick’s law of diffusion. This also works against gastropods and is commonly employed in gardening to defeat slugs. Presumably you could spread it around your plants to be picked up by the woodlice. No doubt there are lots of other treatments, schemes and devices to thwart woodlice, but we seem to have a handle on the problem now with a few simple interventions.